The story of the Commonwealth Games is one of values and evolution. It is a cultural and social celebration of the two billion people who make up a third of the global population — and the diverse races, languages, beliefs, cultures, traditions and perspectives that make up this mass of humanity. This is also reflected in the balanced structure and organisation of the Games. The Games are considered to have three key values: humanity, quality and destiny. These help the Games to symbolise the coming together of the diverse group of nations in a central setting — as fellow human beings. These values are echoed in the Athlete’s Oath, which is taken on behalf of all the competitors at the Opening Ceremony of the Games. The oath goes: ‘We declare that we will take part in the Commonwealth Games of (insert year) in the spirit of true sportsmanship, recognising the rules which govern them and desirous of participating in them for the honour of our Commonwealth and for the glory of sport’. The Commonwealth Games have evolved over time much like the Commonwealth of Nations it represents. 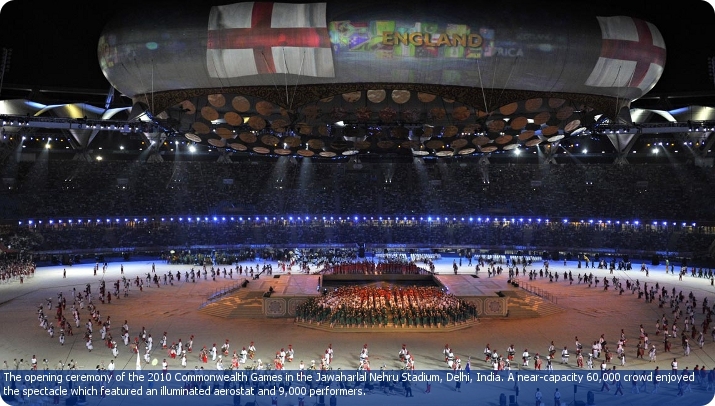 From its inception in 1930 as the British Empire Games, it has mirrored the changing orientation of the greater organisation. It was known by this name until 1950, then from 1954 to 1966 it was the British Empire and Commonwealth Games, 1970 to 1974 as the British Commonwealth Games, and from 1978 it finally became known by its present name. In terms of participants the Games are also significant. In addition to the 54 members of the Commonwealth, 17 overseas territories, island states and crown dependencies take part in their own capacity. These include the Home Nations of the United Kingdom, the Channel Islands, and places such as Bermuda, Montserrat and the British Virgin Islands. These countries/states are able to express themselves through sport, where politically they maybe unable to do so. Each Games has to include a minimum of 10 core sports on their timetable, which include: Athletics, Badminton, Boxing (Men only), Lawn Bowls, Netball (Women only), Rugby 7s (Men only), Aquatics-Swimming, Hockey, Squash and Weightlifting. On top of this they can include an additional seven sports out of: Archery, Aquatics-Diving, Aquatics-Synchronised Swimming, Gymnastics-Artistic, Gymnastic-Rhythmic, Judo, Rowing, Sailing, Shooting-Clay Target, Basketball, Canoeing, Cycling-Road, Cycling-Mountain Bike, Cycling-Track, Shooting-Pistol, Shooting-Small Bore, Shooting-Full Bore, Softball, Table Tennis, Taekwondo, Tennis, Tenpin Bowling, Triathlon and Wrestling. It should also be noted that a maximum of four team sports must also be included (which have been included, to varying degrees, since 1998).